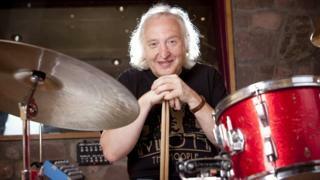 Dale Griffin, drummer for rock group Mott The Hoople, has died aged 67. He was a founder member of the group, best known for classic tracks Roll Away The Stone and All The Young Dudes. The latter was written and produced by David Bowie, who sang backing vocals on the track. The band, who made eight albums during their five-and-a-half year existence, reformed to mark their 40th anniversary in 2009 - but Griffin was too ill to take part. He died peacefully in his sleep on Sunday night, said Peter Purnell from record label Angel Air records. He called Griffin "one of the nicest, friendly and talented men I have ever known." "All he ever wanted was for his beloved Mott The Hoople to reform and it was his determination that achieved that very feat in 2009 but sadly by then he was too ill to perform at the five sold-out dates - though he did join the band for encores." Born in Ross-on-Wye, Herefordshire, the drummer played in a number of local bands before forming Silence with singer Stan Tippens, keyboard player Verden Allen, guitarist Mick Ralphs and bassist Pete Overend Watts in the late 1960s. They got a record contract in early 1969 and went to London to record under producer Guy Stevens, who renamed the band Mott the Hoople after a 1967 novel by Willard Manus. Not long after, Tippens was ousted by vocalist Ian Hunter, although he remained as their road manager. Although they built up a cult following (a raucous gig at the Royal Albert Hall led to the venue banning rock acts), they struggled to sell records and were on the verge of breaking up in 1972, until Bowie stepped in and persuaded them to stay together, placing them under the care of his manager Tony De Fries. He also offered them the song Suffragette City - but they rejected it, prompting the star to write the anthemic All The Young Dudes instead (its narrative forms part of the story of Bowie's alter-ego Ziggy Stardust). The song reached number three in the UK and the top 40 in America, giving the band a new lease of life. Later albums produced hits such as Honaloochie Boogie, All The Way From Memphis and Golden Age of Rock'n'Roll. But the group disintegrated in 1974 when Hunter, suffering from physical exhaustion, cancelled their entire European tour. When rumours then spread that he was making a solo album with Bowie's guitarist Mick Ronson, it led to an irrevocable rift. Griffin, Watts and Fisher continued to play and record under the name Mott, but split up two years later. During the 80s, Griffin and Watts formed a production company and produced albums for Hanoi Rocks and The Cult. Griffin then joined the BBC and produced many of John Peel's Radio 1 sessions from 1981 to 1994, including Pulp, Smashing Pumpkins, Nirvana and Orchestral Manoeuvres In The Dark. He was diagnosed with Alzheimer's disease just as the Mott The Hoople reunion was about to begin. His parts were played by his friend, The Pretenders drummer Martin Chambers, although he joined the band on stage for encores during their five-night stint at the Hammersmith Apollo. Dale is survived by his long term partner Jean Smith.